Well, if you’ve ever found yourself idly speculating what a world without humans but with dogs might look like, then Netherlands-based developer Lucky Kat Studios has you covered. Their latest title, Thunderdogs, takes place in a dystopian future in which dogs have replaced humans as the primary pilots of combat aircraft, and endlessly fight each other over ruined human cities and neon cyberpunk corporate landscapes. Obviously, most of that isn’t true. Thunderdogs is very real, though, and does indeed feature no humans. 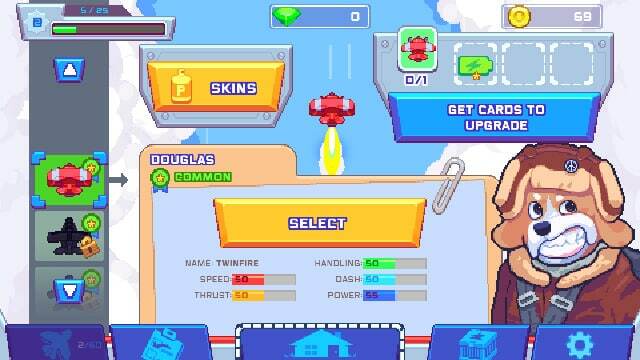 Instead, the pilots of the game’s multitude of combat aircraft are adorable anthropomorphised pooches, and although they are engaged in the business of shooting each other down, it’s all rendered in good humour by Lucky Kat with a retro pixel art style that’s endearing and cheery. 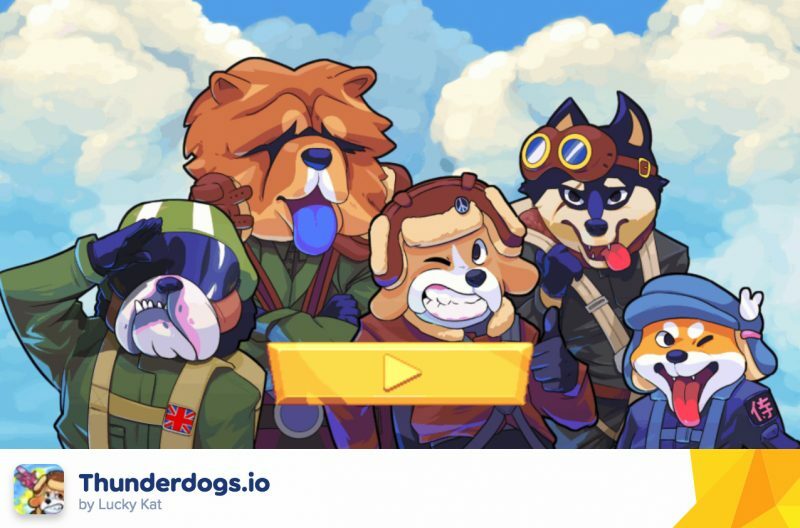 Thunderdogs follows other Lucky Kat productions like Wacky Face and Super Bunny World, and like those games, it’s available for mobile platforms, as well as Facebook Messenger (what a world we live in) and web via your browser. The game’s exclusive to Poki on browsers, so if you want to play this awesome game (which you should, and we’re about to tell you why) then that’s where you need to be. Those of you who aren’t familiar with the concept of .io games might need a quick refresher course. These games inadvertently became a genre when the originator of the .io name, Agar.io, was released back in April 2015. Imitators and tributes quickly followed thanks to the game’s insane popularity, including Slither.io and Vertex.io, among others. Each game subtly iterated on or changed central mechanics, thus ensuring that they became their own genre rather than simply being regarded as derivative. Into this nascent genre comes Thunderdogs, a sideways expression of .io mechanics with a slight twist on the formula. In Agar.io, the goal was to grow bigger by consuming other players; Thunderdogs sees vanquished players leave bones behind, which must be consumed. Just like in Agar.io, though, each bone collected makes the player bigger, so you’re a bigger target to be shot down. Players must therefore balance learning to play the game effectively with making sure they’re not killed for, well, being too big. In service of these noble goals, each player is given a dog with a plane to fly. A brief yet effective tutorial at the beginning of the game communicates the core concepts and introduces the controls (more on which later), then it’s off to the battlegrounds to do noble combat with other players. There’s a bit in the tutorial which simulates other players fighting, and it does so rather effectively, so we’d strongly encourage you to spend some time here before you move on to actual player versus player battles. 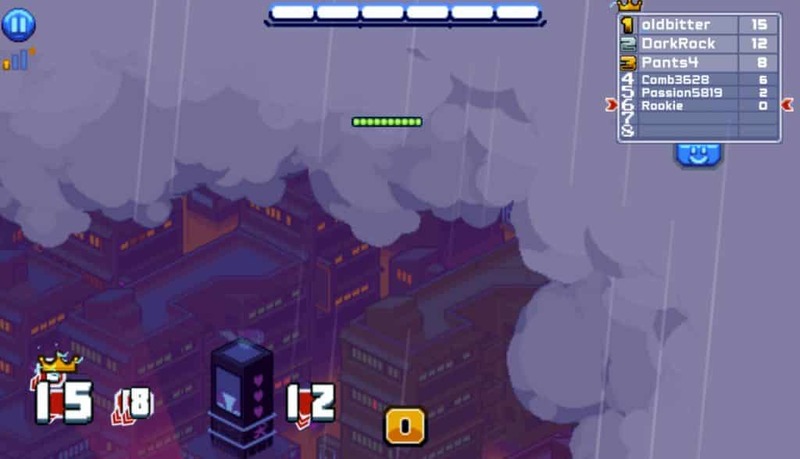 Those who do move on will find a top-down aerial shooter which manages to test the player’s twitch reflexes while also offering strategic depth. Some of this is down to the sheer variety of planes on offer; getting a high score in battle helps to unlock other planes, which have different stats depending on the type of plane. One plane might be “tanky”, able to soak up damage but not give it out, while others are glass cannons, dishing it out just as hard as they take it. Combine this with a robust perk system which adds incremental stat upgrades to planes, and there’s a surprising amount of loadouts on offer to the player. For all of this to work, though, the central combat mechanics have to hold up. The control scheme for Thunderdogs is intuitive, although it’s probably going to take some getting used to for players who are used to games like R-TYPE and Ikaruga. The flight controls here may be more difficult to get used to, but they eventually feel better, especially during prolonged matches. Left and right arrow keys turn the plane rather than strafing it, and the sensitivity is tuned fairly high, so sharp turns can be carried off with little effort. 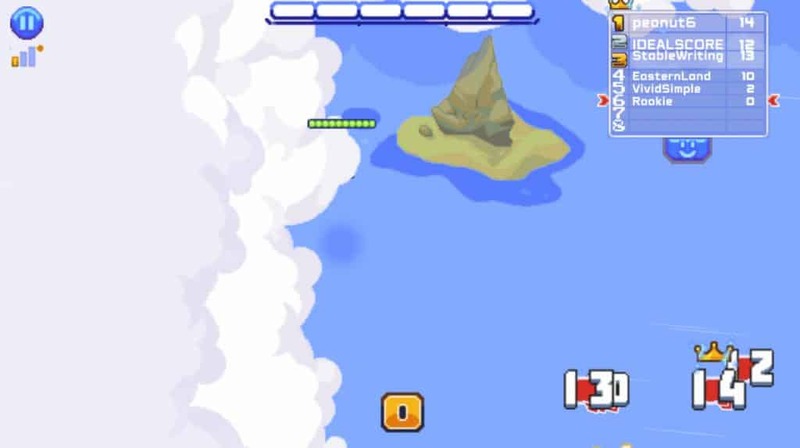 The up arrow key will grant the player a short burst of speed, which is invaluable in escaping persistent enemies or catching up to enemy planes just out of your view. The down arrow key brakes, which you’ll need when you’re about to collide with some of the level geometry because you were over-extending yourself. Put simply, the movement controls just work, and flying planes in Thunderdogs feels great. Each plane handles significantly differently, too, which means a theoretically endless amount of replayability when the perks are factored in. The weaponry on offer is punchy and cathartic, too. Players begin each battle with a cannon-style weapon, which fires slowly but consistently. This weapon is always available, but must recharge after a burst of fire, turning the game into a cat-and-mouse affair where the roles of cat and mouse are constantly switched. Temporary weapons can also be found strewn around the battlefield, each of which packs its own special punch. We were particularly fond of the berserker rage-style machine gun, which empties its entire payload in one shot, scattering the battlefield with a frenzy of bullets heading in all directions. The weapons here feel satisfying to use, and each one is different enough that picking them up adds another layer of strategic depth to proceedings. In the end, though, Thunderdogs isn’t really a strategy game, at least not for the majority of players. Those who are skilled will layer their play style, adding new ideas and plays to ensure they escape with their plane intact after destroying an enemy. For most, though, Thunderdogs is a gloriously enjoyable melee, one which pits many players against each other in a never ending fight to the death with ridiculous weaponry and well-tuned flight controls. Every dog has its day, and this one belongs to Thunderdogs.